GREEN MANSIONS is indeed a wonderful book. Rima Guest House in Middle Street near Main Street was named after the fictional character. Re: the John McCain book. I read it a good while back. Inspiring. If I remember well it is edited by Mark(?) Salter. My copy: blue cover. I just learned something about RIMA Guest House. I worked at the travel service - RORAIMA TRAVEL SERVICE, that used to be on the lower flat. Rima Guest House was owned by KINGS( I think they are ex-pats). Their son Jonathan used to dribble a basket-ball on the seawalls. 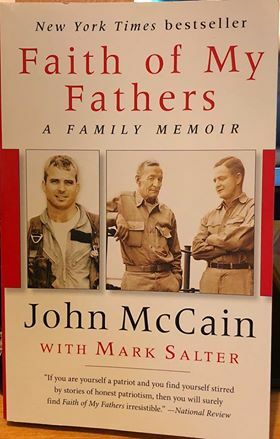 Mark Salter indeed edited "Faith of My Fathers" I became interested in reading it along with For Whom The Bell Tolls(never read it, although my older brother had it) when I saw Sen.McCain's funeral on TV.